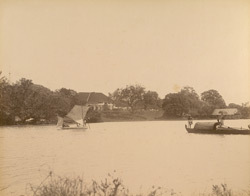 Photograph taken about 1900 by the Government photographer, Zacharias D'Cruz of the Quilon Residency and Backwaters, in the erstwhile Travancore State. It is one of 76 prints in an album entitled 'Album of South Indian Views' of the Curzon Collection. George Nathaniel Curzon was Under Secretary of State at the Foreign Office between 1895-98 and Viceroy of India between 1898-1905. The view has been taken from across the canal towards the Residency. Quilon's natural position made it one of the greatest ports of trade even in the ancient times. Till 1829, it was the capital of the Travancore State, the Dewan, the Appeal Court and the British Resident all holding their headquarters here. From 1803 to 1830 a strong British garrison was stationed in this town after which it was reduced to one native regiment.